Anyone intent on picking up a guitar and busking in Dublin city must now have a repertoire of at least 20 songs, according to a new street performers' code being piloted by Dublin City Council. The city's famous buskers and street performers are no longer allowed to "hog or monopolise a performance site", or set up within 50 metres of each other. Amp free zones, limited times, and sale of merchandise are also included in the code of practice. Singer Karl Shane McCannon is setting up his equipment in a lucrative corner of Temple Bar. "This is a good spot, you make a few quid and get a good crowd as well" he says. "I'm just playing the guitar and have a mic and a 15 watt amp." "I'm not being cocky or anything but I have a repertoire of at least 30 songs, so I'm sorted, but I feel sorry for the guy who is playing Wonderwall all day." Dublin City Council Arts Officer Jim Doyle said the code, developed with local traders and Dublin's street performers, honours the unique contribution that buskers make to the city. "The code as it stands is self-policing and most of the buskers are getting on board," he said. At the bottom of Grafton Street a large crowd has circled in awe of a one-man 'beat boxing' operation but shop manager Richard O'Rourke is seeing red. "Look around at my empty shop, that's just way over the wattage allowed and it's affecting us big-time, we'll just have to ring the Garda," he says. Canadian street performer Scott Jackson concedes that he is one of Grafton Street's loudest buskers. "I'm a human beatbox," he explains. "I use vocal percussion using my mouth, tongue, lips and parts of my throat to make different noises. "Yeah I'm loud, but since I've been here I've had more people from these shops come out and tip me than tell me to stop." Flower seller Catherine Claffey is not impressed by Grafton Street's buskers. "I'm probably classed as being one of the cranks on the street because I don't let them play too near me, they disrupt my business and business is bad enough, so I just kindly ask them before they set up will they move somewhere else." And she is not confident that the new code is going to make any change. "Not at all. It's only encouraging more of them to come in here, that's all." Across the way a garda (police officer) has just asked singer Ciaran Mackey to turn down his amplifier. "It's because of this new code," sighs Ciaran. 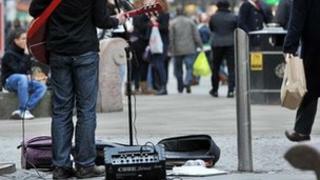 "It's getting harder to make money from busking. "That said on a good day in two hours you might make 150 euros, but believe me it's hard for people who are playing music."